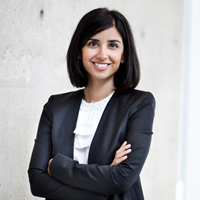 Sonia Kang is an Assistant Professor in the OBHRM area as of 2011. Before coming to the University of Toronto, she was a Postdoctoral Fellow in the Department of Psychology at Northwestern University. She holds an M.A. and a Ph.D. in Psychology from the University of Toronto, and a B.Sc. (Hons) in Psychology from the University of Alberta. Broadly speaking, Sonia's research examines barriers to and methods for optimizing diversity. She is particularly interested in the experience and effects of prejudice and discrimination, and examines these phenomena across the lifespan, from childhood to old age. Some of her previous research projects have examined the development of stigma consciousness among children, behavioral and neural effects of stigma and stereotype threat on adults, and the consequences of stereotype threat on the cognitive performance of older adults. She is especially interested in applying knowledge gained through social psychological research to policy and real-world interventions. Stigma Building Blocks: How instruction and experience teach children about rejection by out-groups; Kang, S.K., & Inzlicht, M.; Personality and Social Psychology Bulletin; Issue: 38; 2012; Pages: 357-369. Personalized Persuasion: Tailoring Persuasive Appeals to Recipient Personality Traits; Hirsh, J. B., Kang, S. K., & Bodenhausen, G. V.;Psychological Science; Issue: 23; 2012; Pages: 578-581. Research-based advice on teaching children not to be racist; Kang, S.K., & Apfelbaum, E.P. ; The Atlantic; 2012; Pages: Available at The Atlantic online April 12, 2012. Facing social identity change: Interactive effects of current and projected collective identification on expectations regarding future self-esteem and psychological well-being; Packer, D., Chasteen, A.L., & Kang, S.K. ; British Journal of Social Psychology; Issue: 50; 2011; Pages: 414-430. Lingering effects: Stereotype threat hurts more than you think; Inzlicht, M., Tullet, A.M., Legault, L., & Kang, S.K. ; Social Issues and Policy Review; Issue: 5; 2011; Pages: 227-256. Stereotype threat spillover: How threats to social identity affect eating, decision-making, and aggression,; Inzlicht, M., & Kang, S.K. ; Journal of Personality and Social Psychology; Issue: 99; 2010; Pages: 467-482. Social Neuroscience and Public Policy on Intergroup Relations: A Hegelian Analysis; Kang, S.K., Inzlicht, M, & Derks, B.; Journal of Social Issues; Issue: 66; 2010; Pages: 585-601. Your mistakes are mine: Self-other overlap predicts neural response to observed errors; Kang, S.K., Hirsh, J.B., & Chasteen, A.L. ; Journal of Experimental Social Psychology; Issue: 46; 2010; Pages: 229-232. Beyond the double-jeopardy hypothesis: Assessing emotion on the faces of multiply categorizable targets of prejudice; Kang, S.K., & Chasteen, A.L. ; Journal of Experimental Social Psychology; Issue: 45; 2009; Pages: 1281-1285. The moderating role of age-group identification and perceived threat on stereotype threat among older adults; Kang, S.K., & Chasteen, A.L. ;International Journal of Aging and Human Development; Issue: 69; 2009; Pages: 201-220. The development and validation of the age-based rejection sensitivity questionnaire (RSQ-Age); Kang, S.K., & Chasteen, A.L. ; The Gerontologist; Issue: 49; 2009; Pages: 303-316. The neuroscience of stigma and stereotype threat; Derks, B., Inzlicht, M., & Kang, S.K. ; Group Processes and Intergroup Relations; Issue: 11; 2008; Pages: 163-181. Social categorization and perceptions of social groups; Bodenhausen, G.V., Kang, S.K., & Peery, D.; In S.T. Fiske & C.N. Macrae (Eds. ), The Sage Handbook of Social Cognition. ; Issue: Thousand Oaks, CA: Sage. ; 2012; Pages: 318-336. Aging and stereotype threat: Development, Process, and Interventions; Chasteen, A.L., Kang, S.K., & Remedios, J.D. ; In M. Inzlicht & T. Schmader (Eds. ), Stereotype Threat: Theory, Process, and Application. Oxford, UK: Oxford University Press. ; 2011; Pages: 202-216.